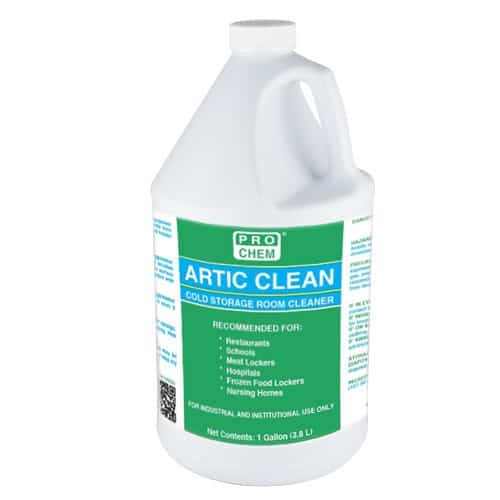 ARTIC CLEAN | Pro Chem, Inc.
ARTIC CLEAN is a ready-to-use floor, wall and equipment cleaner. This heavy-duty formula removes dirt, grime, fat and grease deposits from hard surfaces. It is ideal for use in cold storage and freezer areas that have subfreezing extremes up to -44°F. It is safe for use on galvanized metal and concrete. Automatic scrubbers: Use steel, wire or other aggressive brush. Fill tank with undiluted cleaner. Lay down solution with scrubbing action. Allow solution to remain on surface for 5 minutes. Scrub again and pick up soiled solution with wet vac or mop. Rotary floor machine: Use steel, wire or other aggressive brush. Apply solution by spray or mop. Allow to soak 5 minutes. Scrub well and pick up with mop. Manual cleaning: Apply cleaner by spray, mop or sponge. Follow with aggressive, double brushing or scrubbing. Pick up with wet vac or mop. Important instructions on rinsing: This product may be rinsed at temperatures above 0ºF. Always wet vac or mop dry to prevent any resulting residue.